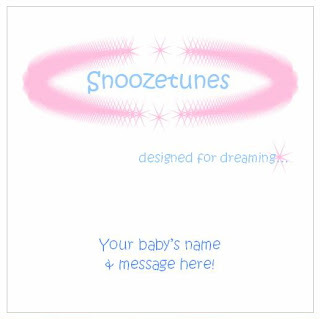 Snoozetunes has been made by Chris Gardner, of Chiptunes and of My Space fame too, and is specifically, as the title would suggest, aimed at children as a way of drifting off into a peaceful and calm sleep, rather than screaming themselves off, like Little Tot is often known to do. But what makes it different to the usual nursery rhymes on CD sung in soft tones? Well, for starters, there are snatches of classic and well known nursery rhymes included, but these are cleverly mixed in with original compositions. They are also not too jingly as to make a parents teeth hurt with the cutesyness of the music, rather, I found them just as relaxing to listen to as Little Tot did, and Big Tot liked it too, preferring to make up her own songs along to the musical accompaniment. The disc eased a usually fractious Little Tot to sleep with ease, and its writer puts this down to his use of music which is at a natural tempo of a baby's heart rate, with the melody kept at a pitch on a par with a Mum's soothing voice patterns. This is especially clever considering Chris himself isn't a Dad, but started to make the discs for family and friends, after the births of his two nieces (both of whom have tracks dedicated to them). It contains 9 tracks, all different and equally engaging, and with 40 minutes of music, its not long before Little Tot nods off. He is also much calmer during the day, and less likely to wake up as often as he was- and even when he does wake in the night, its not with as much upset as before, and he is happy to have a hug and off back to sleep. Which pleases the rest of The Family Panel too! The Disc itself may not come in an overly fussy box, but it does have the option of having your child's name on the front. It would also make a great and unusual gift for friends and family, as a message can be included along with the child's name, as a lovely and useful keepsake. The disc itself is said to be the beginning in a series of music of the same type for babies, as well as more promised for both adults and older children too. They are soon to be available through the Gift Wrapped and Gorgeous website, but you can also ask Chris to make a disc for you for other occasions as well as the Snoozetunes disc. Another great My Space find! Definitely recommended for those who are longing for a good nights sleep!